Zongmi (宗密) (780 — 841), also commonly referred to by the monastic title of Guifeng (圭峰), was a Tang dynasty Buddhist scholar-monk, installed as fifth patriarch of the Huayan school as well as a patriarch of the Heze Chan lineage. He wrote a number of vitally important essays on the current situation of Buddhism in Tang China, and is one of the most important figures in East Asian Buddhist history in terms of providing modern scholars with a clear analysis of the development of Chan (Zen) and Huayan and the general intellectual/religious climate of his times. Unlike some of his more radical and cryptic Chan contemporaries, he was a meticulous scholar who wrote extensive critical analyses of the various Chan and scholastic sects of the period, as well as numerous scriptural exegeses. Zongmi, like many later Korean monks on whom he extended his influence, was deeply interested in both the practical and doctrinal aspects of Buddhism, and especially concerned about the means of harmonizing the views of those that tended toward exclusivity in either direction. 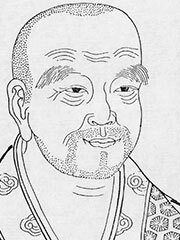 Zongmi studied deeply all the major texts of the Chinese Buddhist canon of his time, specializing in those works with Huayan, Tathāgatagarbha and Chan affinities. He was deeply affected by Huayan thought and is famous for his work in the area of doctrinal classification: the attempt to account for the apparent disparities in the Buddhist doctrines by categorizing them according to their specific aims. Although he conducted other important studies on texts such as the Huayan Jing, Awakening of Faith, and Diamond Sutra, and dealt with such issues as the rapprochement of the three teachings and the relationship of various schools of Chan, Zongmi’s work on the Sutra of Perfect Enlightenment (Yuanjue Jing)was the centerpiece of his scholarly career. His most important work on the sutra was his Yuanjue Jing Da Shou (Great Commentary on the Sutra of Perfect Enlightenment). During the process of finishing this work, Zongmi wrote a series of abridgments, expansions and discussions of it. Zongmi’s other notable works include the Yuanren Lun (Inquiry into the Origin of Humanity) and the Chanyuan Zhuquan Jidu (Origins of the Various Chan Teachings).